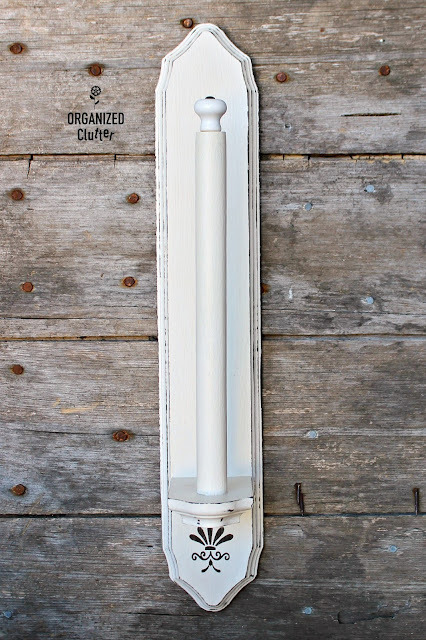 My project started out with this cream colored thrift shop wall sconce. I purchased a 7/8" x 36" dowel at a local craft shop. If you can find a pine dowel, it will be easier to complete this project rather than a hardwood. Dowels are available at most craft shops or lumber yards. I removed the wooden "candle cup" with a Phillips head screw driver, sawed off a 10" length of my dowel and screwed the dowel into the candle cup holder. This is the bottom of the candle cup holder with my screw. Be sure to drill starter holes in the dowel. Next I painted the sconce and dowel with Dutch Boy Chalky Finish Paint in Antiquated Lace (from Menards). I used my FolkArt Home Decor Layering Wood Block, 36046 to "faux" distress my sconce on the edges. An in depth look into my technique with the layering block can be found HERE. I usually always use Delta Creative Ceramcoat Acrylic Paint in Assorted Colors (2 Ounce), 02024 Walnut with the layering block. The multiple sconce edges worked well with the layering, but I have to be honest. Occasionally I make a mistake with the layering block and have to touch up a spot with my base color paint. It's very easy to touch up a spot with a small art brush! I sealed my project with Varathane 262075 Half Pint Clear Matte Finish Soft Touch Polyurethane . This product is water based for easy clean up and is non-yellowing. I love the matte finish product. I also added a little design from a Deco Art Andy Skinner Mixed Media Stencil, 8" by 8", French Elements . A white ceramic knob was screwed into the top of my dowel for extra decoration. It is from Menard's and has a front mount screw included in the packaging in black or gold. I used black. 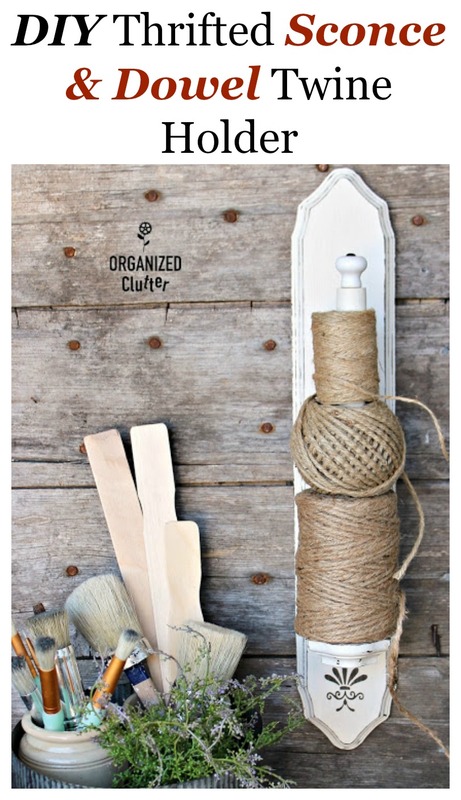 I can add three different spools of jute twine on my 10" dowel. Cute!!! You could also stack bracelets on the bar or hang it sideways for jewelry... that's where I thought you were going with it at first. 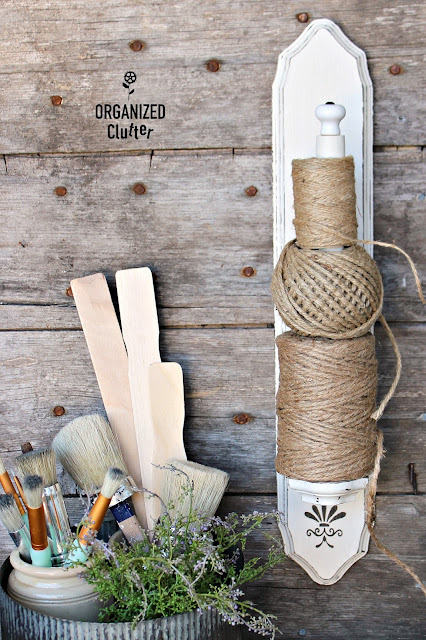 Love the string idea, so useful! so cute and organized! if it's deep enough, i think one could be made for paper towels! It didn't look like the space was deep enough (from the dowel to the edge of the wood), but, apparently it is. About how many inches is the space? LOVE, LOVE, LOVE YOUR BLOG ! Really cute! You could do that with one of those wooden paper towel holders too. Hubby borrowed my roll of jute twine & I've never seen it again! Love it when a rehab is actually useful and not just another decorative item. Well done! 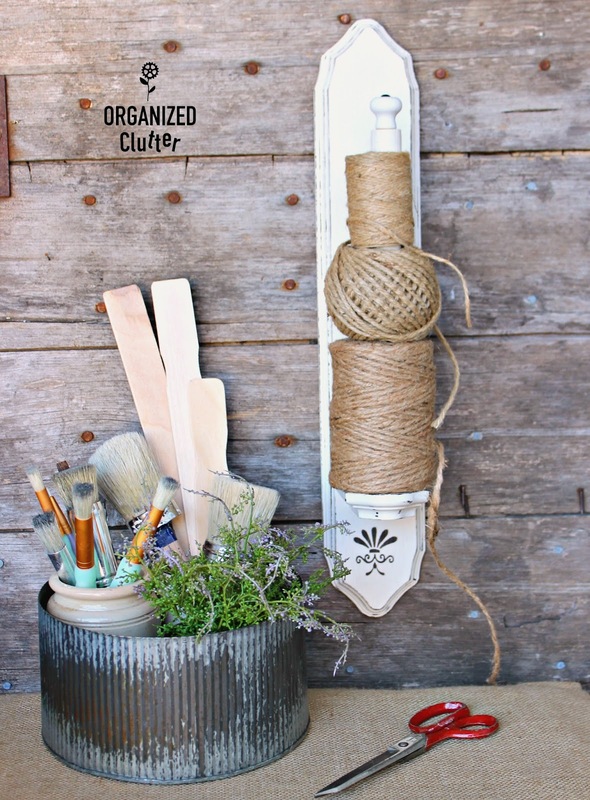 Very clever idea, and makes a pretty way to store your twine.